…And so on and so forth. Each segment of a line is split out and sent to a corresponding code object, one for each block of text. These can then be sorted and sent to the main Unity3D engine. 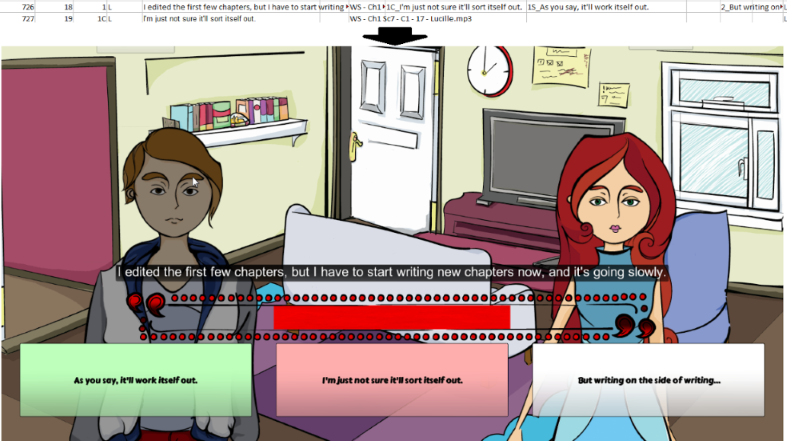 Inside the scene, we place an object for everything we want to appear – characters, background art assets, music, and of course the game text, represented in game by a subtitle bar. As each line of text is synced to a corresponding voice file, the scene pacing is automatic – after a line plays, it automatically leads into the next. Meanwhile, at the end of each block, the questions available to Lucille are sent to additional text objects – the main question buttons. As each text block is stored as a separate object, flowing through the full scene can be handled with a few simple triggers. Each button stores the name of the text block it leads to, while the primary script listens for the name of a button being pressed. When it receives one, either from the player pressing a button or the timer running out and taking a predetermined outcome, it can proceed with the next block of text, starting the cycle anew. And in this way (with a few iterations and improvements as we go) we put together the primary engine for Dialogue. I can’t wait until you get to try it out first-hand! And that’s how each line of the spreadsheet becomes a moment in the game.